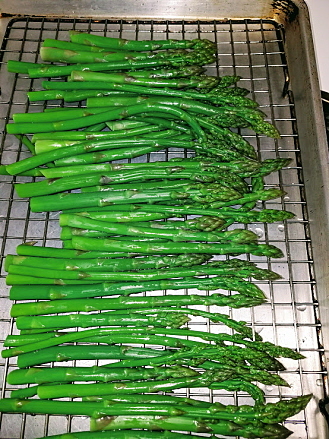 1 st batch of the year, wild asparagus, blanched & vacummed sealed. You sure can't beat FREE!! What's your favorite way to cook them Joey? I like mine oven roasted with olive oil, garlic, salt and Italian seasoning. Give me the nice thick stalks every time. They have so much flavor. If I like a food and plan on pigging out on it, I want the flavor to come through for me. For me, asparagus should taste like asparagus! That was the next batch Addie, I separate the males & females. A thing of beauty! Look at that asparagus.